As I said about this time last year, this will be my last update for the current academic year 2014/15 so you will not hear from me again (unless you follow me on Social Media) until after the summer holidays, in September 2015 when I send out my Autumn Term SEN Update. Well, we’re here! 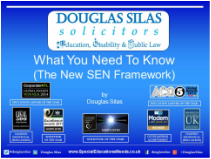 It has now been almost a full academic year since the implementation of the new SEN framework, that was brought into force legally on 1 September 2014, as a result of the Children and Families Act 2014 and the new SEND Code of Practice. Many people, both parents and professionals, say that they cannot believe that we have actually made it to this point without the world of SEN collapsing. However, some tell me that they now feel that they are in a bit of limbo, as they are currently dealing with some children/young people who have Education, Health and Care (EHC) plans, either as a result of an EHC needs assessment that took place after 1 September 2014, or as a result of having a Statement of SEN transferred to an EHC plan. But, at the same time, they also tell me that they are still dealing with a lot of children/young people with Statements which have not been transferred yet and which are only due to be transferred to EHC plans within the next few years and, in any event, by April 2018. Please do not quote me as saying that this is true, but I have heard it said by some people that it was perhaps too ambitious a task for us to think that we could successfully transfer 230,000-odd Statements (that were in existence at the beginning of September 2014) to EHC plans, within just under four years, as was expected/planned. Some people even say now, especially with the benefit of hindsight, that it is probably more realistic for us to now suggest that the whole process is going to take more like eight to 10 years to complete! There are also some that say that perhaps we should be more realistic and look towards other possibilities at this point, before it gets more difficult. Wherever you stand on this issue (or sit, if like me you are a wheelchair-user!) it is now a fact that we also recently have put a new Government in place (although some say that it is really the same Government as before, albeit that there is now no ‘yellow’ mixed with the ‘blue’). It is arguable that the politicians therefore may just choose to leave everything as it stands, or to just ‘tweak’ some things that have not been working well. But I have increasingly noticed during this past year the mounting confusion about what people should actually be doing now under the new SEN framework, on the parts of both parents and professionals. I know that we were hoping that the new spirit of ‘working together’ should mean there were less disputes about SEN issues, or finding other, more amicable, ways of resolving disagreements, rather than always having to rely on an appeal to the SEND Tribunal. However, again unfortunately, it has been my experience (which is biased of course because parents only come to see me when something is not right) that things sometimes feel the same, albeit that we now are trying to call or do things differently. For example, I still wonder why some disputes need to reach a Tribunal appeal hearing or, when I come out of a Tribunal appeal hearing, how on earth unrepresented parents would have been able to manage without my help, when faced with being opposed by a Local Authority (LA) represented by a barrister, solicitor or an Education officer that is quoting law at them and who is used to doing these kinds of things regularly. 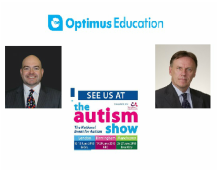 I am now looking forward to attending The Autism Show next week, which is being held in London on 12/13 June 2015 (and thereafter in Birmingham on 19-20 June 2015 and in Manchester on 26-27 June 2015). P.S. I always find it helpful to find out what people think about my updates, so please take a few seconds to tell me what you think by going to ‘Summer Term (Half-Term) 2015 update – your thoughts’ – there are just 3 quick questions.